McCain Missed Private Benghazi Hearing Because of "Scheduling Error"
Josh Rogin reports that John McCain and Rand Paul, both of them very public critics of the administration over Benghazi, skipped yesterday’s private hearing on the debacle. And McCain spent basically the entirety of Wednesday criticizing the administration – TV in the morning, a press conference in the late morning, a Senate colloquy after President Obama attacked him. 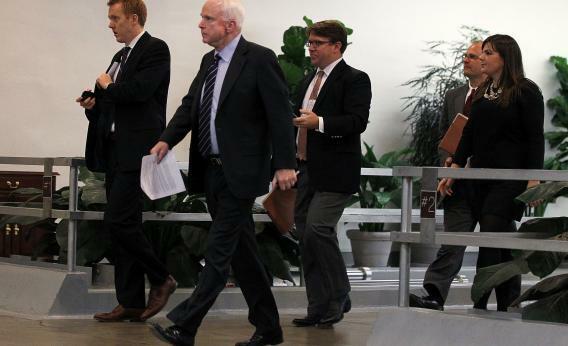 “Senator McCain was absent from the hearing due to a scheduling error,” says McCain spokesman Brian Rogers. Why does this matter? The current round of Benghazi hearings are closed, and senators are not allowed to talk about what occurred inside them. “You’ll have to read the New York Times to find out,” joked Marco Rubio this week. McCain wants public, select committee hearings, which have been accurately described as “Watergate-style” – public, on TV, key players dragged in front of a national audience. And neither the Speaker of the House nor the Senate Majority Leader want to take this step.